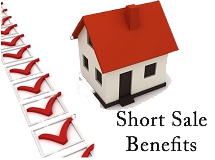 What are the benefits for all parties involved in a Short Sale? To my Short Sale enthusiasts! I know all Real Estate professionals have tossed and turned over whether or not to get involved in Short Sales. These transactions are not easy, there is no set pattern that guarantees success, nor do they offer a measurable return on your investment of time. If all of this is true, then why do I continue writing about these types of transactions? I’ll tell you why… if it were easy, everyone would be working on them, which would pose it’s own set of problems from incompetence to saturation of agents. The sentiment is changing once again, and statistics show some positive reasons why homeowners should want to get their homes sold through Short Sales. A recent series of publications reveal the following benefits selling with a Short Sale as opposed to Foreclosure. A Foreclosure can lower a credit score by as much as 400 points. A Short Sale will lower a credit score by around 80 to 100 points. A Foreclosure can delay the homeowners ability to purchase by as much as SEVEN (7) years. A Short Sale can enable some sellers to purchase a home again in TWO to THREE (2-3) years. Some Lenders are offering credits for moving expenses to sellers who cooperate. The Lender benefits by a quicker turnaround than if they have to Foreclose, saving the Lender the carrying costs, repair costs, and a host of other problems for a Lender who is not in the business of owning homes. Lenders are now educating their workers to be less problematic when dealing with Short Sales based upon the financial benefits, and the pressure from the Government. The playing field provides a great opportunity for all agents to educate themselves and capture a part of the Real Estate sales that are growing every year. As a famous Entrepreneur said in the mid 1800′s in California, “There’s GOLD in them thar hills”. This could be the GOLD RUSH you are waiting for! This may not be easy an task, but usually anything worthwhile requires effort. If you have any questions, concerns or would like more information comment this post, email, or call (718) 377-7798 to speak with Michael Reinhardt.